It's all in the works. Busy as little bees the Sweet gang is, getting ready for one of the best Sweet Salvage Events of the year. Every February it is Sweet Salvage's goal to stretch the design limits. Searching at little bit harder for that true diamond in the rough and making it shine. Raw and Refind defined..... 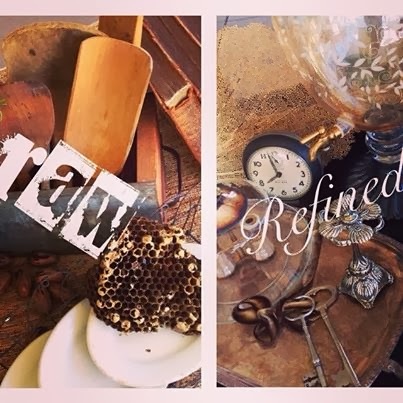 Using found objects, re-purposing them, bringing together a pairing of the unexpected, refining through embellishment, adding a little funky and creating a new. The current design trend Rustic Luxe is just that mixture. A little of this, a little of that, mixed in with a whole lotta "Shazam Wow"! Sounds like fun right? It sure is. That is why the Sweet Gang gets so fired up for this event. Join us on Facebook this month for the ingenious "Before and After" photos and play along to "What would you do with that?" As a little added fun this month, Sweet Salvage will have not one, but two special guests. One of them will be hosting the first ever Sweet Salvage Hands on Workshop on February 22nd. I would love to let the cat out of the bag but you, my friend, are just going to have to wait a little bit longer. Call it my take on the unexpected....wink.